Watching your puppy grow up into a full-sized pup before your very eyes is often a slow but incredibly rewarding part of owning a pup! What is there to not be proud of, to marvel at? Of course, the problem with growing up is that they don’t stay very small for long! 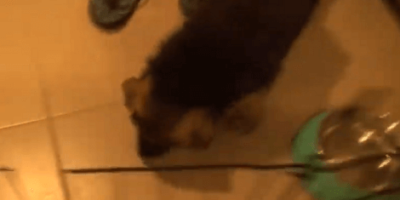 This adorable German Shepherd has just arrived back home for the very first time! At only 8 weeks old, he is tiny, and his ears haven’t stood up just yet. Until he grows a little bigger and gets used to his new home, he will be kept quarantined in a little playpen for a while. Luckily for him, it doesn’t last long! Over the next few months, this puppy proves himself to be absolutely adorable! You can see just how much joy and happiness he brings into his parents’ lives, and how much they love him in turn. And in this video montage, you can watch him get bigger and his ears stand up too!